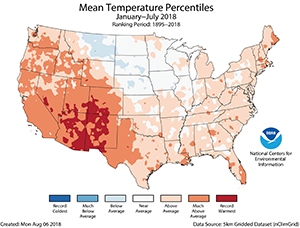 NOAA has just released their monthly climate summary for July 2018. 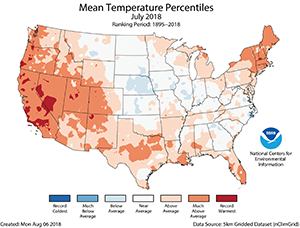 It shows that for the contiguous 48 states, this July was tied with 1998 for the 11th warmest. Most of the Southeast, however, was near to slightly below normal except for Florida. 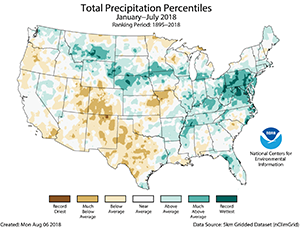 Precipitation was near the long-term average, with some areas very wet (like the Mid-Atlantic states) and other areas extremely dry. 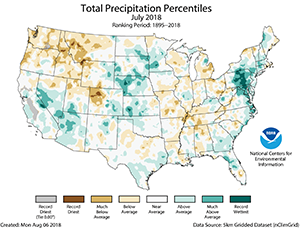 You can read the report at https://www.ncei.noaa.gov/news/national-climate-201807.